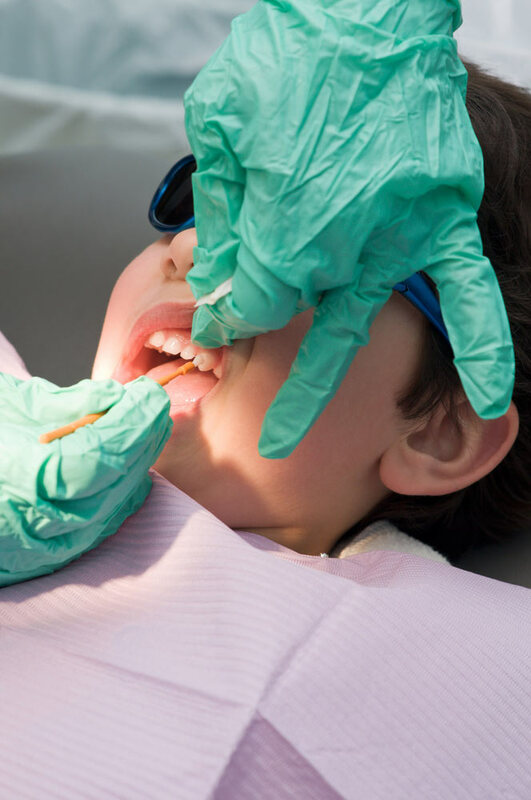 Following the cleaning and flossing procedures, fluoride will be applied to your child’s teeth to help maintain the enamel in its strongest condition. The foods we eat and the things we drink can dissolve some of the mineral content out of the enamel, which is the first stage of a three-part process in creating a cavity in a tooth. The fluoride reinforces the tooth structure and can actually reverse a small cavity that is present in only the enamel. Fluoride varnish is the treatment of choice in our practice because its effects on the enamel last up to 36 hours. Varnish is a sticky fluoride application that remains on the tooth throughout the day and is gradually absorbed into the enamel. Because it actually binds to the tooth, the patient can eat or drink 30mins following this fluoride application. Very little amount is applied. The daily brushing three times a day with minute amount of fluoridated toothpaste (grain of rice size) contribute to the same preventive goal.